So, as UX designers, which way should we turn to ensure the best user experience strategy? Originally, Skeuomorphs were used to make computer software more approachable to novice users. This popular tactic was the primary reason we got to the modern day desktop GUI, with free-floating files and manila folders scattered about the computer screen. But now that digital versions of object visuals have been around sufficiently long enough, many Flat Design advocates argue that we should use purely digital visual representations. Recent popular designs have gotten rid of beveled edges, gradients, shadows, and reflections, creating a user experience that plays to the strengths of digital interfaces, rather than limiting the user to the confines of the familiar analog world. 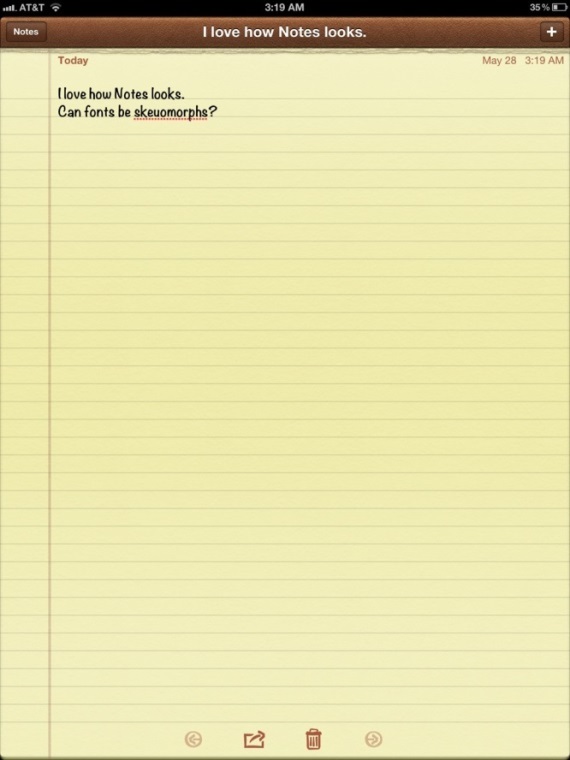 Skeuomorphism vs. Flat Design can best be exemplified in Apple vs. Windows applications. Fake leather, wood, paper and glass are commonplace in Apple applications, in addition to real-world metaphors like bookshelves, paper shredders, and even casinos. Apple’s “Notes” application, perhaps the most heavy-handed of the skeuomorph players, literally looks like a classic yellow note pad. 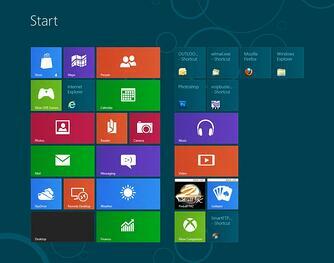 The new Start Screen makes use of flat, colored live tiles and a laterally scrolling canvas, also used in Windows Phone and Xbox 360 Dashboard. The design language places emphasis on good typography and has large text that catches the eye, which Microsoft sees as "sleek, quick, modern" and a "refresh" from the icon-based interfaces of Windows. With the release of iOS 7 soon upon us, Apple will be playing catch up in the marketplace with Google, Microsoft and the industry as a whole. 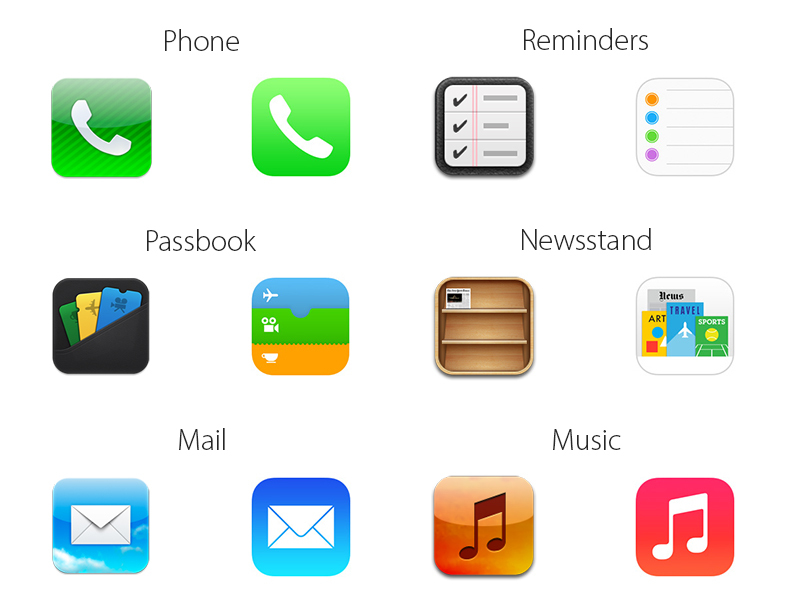 Scott Forstall, the former Senior Vice President of iOS Software at Apple, was heavily criticized for his skeuomorphic design style, but since his exit from Apple Jonathan Ive, the new leader of Apple’s Human Interface team, will be focusing on a flat UI with “black, white and flat all over,” dropping heavy textures altogether. Regardless of whether Flat Design is able to stand the test of time, it is my opinion that great design ultimately comes down to a deep understanding of how users expect to be served by a system and a sincere empathy for the ways they think, feel, and want to interact with the world. Designers have to conduct user research to design user experiences with the right balance of controls that have depth, and possibly analogues from the real world, along with purely flat controls that exist only in the digital world. Of course, these approaches need to be part of a meaningful and unified design system, but it is clear that a thoughtless adherence to an entirely skeuomorphic or flat approach to user experience design is not the best way forward for designers if our goal is great design outcomes. A more balanced approach is required. 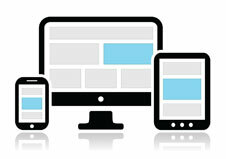 See how we improve user experience for our web and mobile clients.